Happy Birthday to the hottest 40 year old I know? So what’s your secret? Seriously, I won’t tell anyone. The first 40 years of childhood are always the hardest! Happy Birthday! You’ve come a long way, baby… past awkward teens, trying twenties, thrilling thirties. Welcome to the Fabulous Forties!! 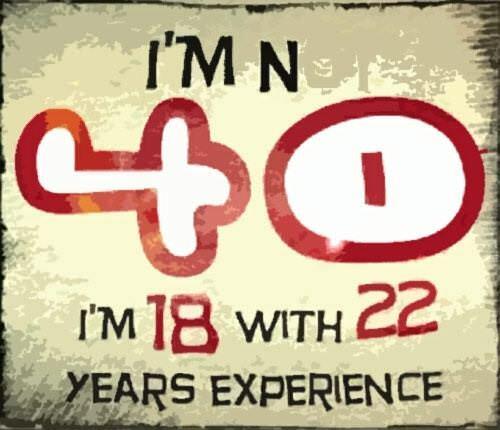 Joy begins at 40! Happy Birthday! You are one of my most favorite people in the world, and I’m so glad to help you celebrate this awesome milestone birthday. Alert the Vice Squad! Your 40th birthday bash is going to become the stuff of party lore! Dude! You have always been a badass, so there’s no reason to believe you won’t rock your forties… Party On! Some people make a smooth, elegant, dignified transition into their 40’s. Yeah, I don’t want to do that either! For your 40th birthday, I’m going to thank God for allowing us to be together all these years. Here’s to another 40! Turning forty presents so many opportunities. Saying “no” to stuff you don’t want to do, wearing whatever clothing feels good, AND celebrating the day in style! After everyone’s gone and the party mess is cleaned up, I’ll still be your best friend wishing you Happy 40th. I know you’re slightly upset about this “Big 4-0” birthday. I have a solution: Let’s kill it, party it down into submission! For all those things you wanted to do but never dared to, our 40th birthday gives you complete license to do them! Would you rather have 25 gold coins or 40? Twenty-five admirers or 40? A mere 25 years of awesomeness or 40? Happy Awesome Birthday! On your 40th, it’s hard to wrap our minds around that age, but it’s easy to remember all the fun we’ve had Here’s to more fun! You’ve meant so much to me throughout our relationship, and now that you’re turning 40, I know the best is yet to come. Hey Birthday Girl — Life may not actually BEGIN at 40, but the ability to appreciate this awesome life DOES. Because you’re turning 40, I’ve been remembering all the great times you have given me. I’m gratefully and forward to much more. 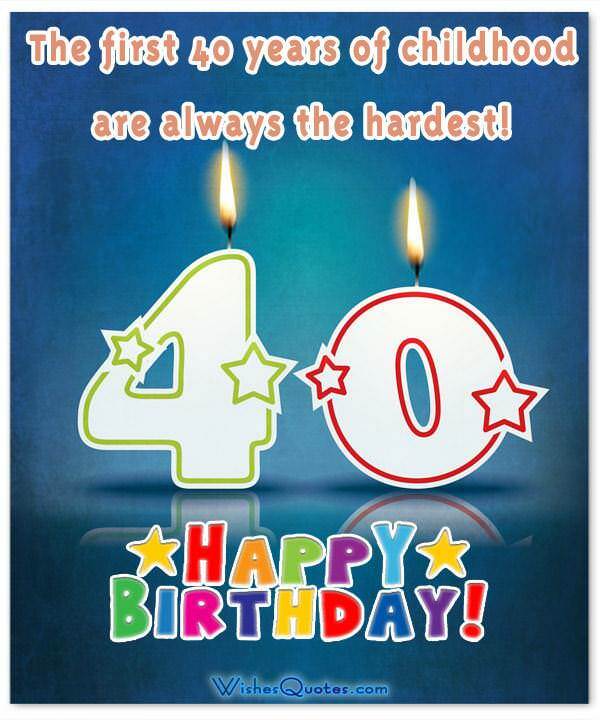 Happy 40th Birthday, and remember, learning, growing and improving never ends. On your 40th birthday, just letting you know that you rocked 20, rocked 30 and clearly are rocking this milestone even more. Hey 40 year old – I think we’re WAY overdue for an exciting, gossip-generating, shameful mid-life crisis, don’t you?! This may be inappropriate, but at 40, you are HOT… I mean really hot…like nuclear blazing inferno hot. Happy Birthday! Hey, let’s take all the fun we had at age twenty and double it! The fire extinguishers have been checked, the ant-acid is in the cabinet, and the Vice Squad has been alerted. Happy 40th Birthday! 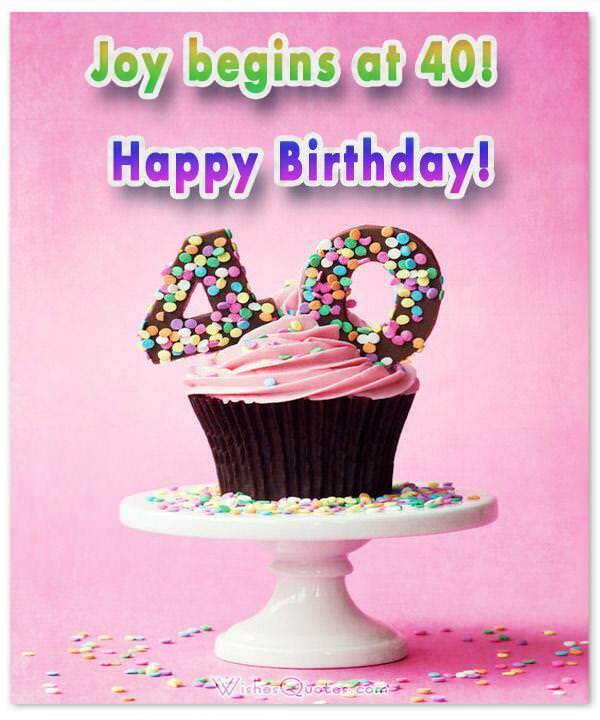 I turned 40 before you so I know this is the beginning of a wonderful, serene yet uninhibited part of life. Enjoy! We are so blessed to have been graced with this many years on the planet. God Bless you on your 40th birthday. “Step up, ladies and gentlemen…see for the first time on this continent the man who never ages!” Happy 40th, my ageless friend. Forget the wrinkle creams and plastic surgery. Enjoying your 40th birthday to the max is the way to stave off aging. Living the truth, a kissing booth, turning the page and loving our age — these are the secrets to a great life. Happy 40th! Bucket list: 1.Look great for your age. Check! 2.Be kind and loving to others. Check! 3.Have a glorious 40th birthday. You’re always caring for others so passionately that, on your 40th birthday, I wish you tranquility and serenity. No, you’re not turning 40. You’re still 25. It’s that space/time warp/continuum thing — all very scientific. At age 40, we’re supposed to have mastered much of life. You’re such an over-achiever! Happy 40th birthday. You can look back on those years with satisfaction, knowing the future will be even better. You’re a great “life example” and now that you’re turning 40, you’re as vital a part of my life as ever. Thanks. How did 40 years go by so fast? Probably because you have lived them to the fullest! You’re a prime example of how life continues to teach us, thrill us, and make us better with each year. Happy 40th! You are SO rocking this 40th birthday, that I’ve decided I’m going to follow in your little size 6 footsteps. Beautiful, competent, teachable, vibrant: That’s what you make 40 years old look like. I know you’ve live a full life in your 40 years, but I’m confused why none of it shows on your face! Happy 40th, whipper-snapper. They say as you get older, you begin to digress. On your 40th birthday, I suggest you digress to your college days! Happy Birthday to my 29 year old friend… from your 110 pound supermodel friend. We’ve all heard people say things like “I’m 39 and holding” or “this is the second anniversary of my 39th birthday.” For some reason, there is a negative stigma surrounding the “Big 4-0h.” Actually, for most people, crossing that dreaded milestone marks the beginning of a great new chapter in their lives. Gone are the insecurities of the 20’s, the relentless ambition of the 30’s, and what is left is assuredness. At the age of forty, we have gained knowledge about the world but, perhaps more importantly, we know ourselves and feel comfortable in our own skin. So if a friend or loved one is coming up on this milestone, let them know the horizon is bright. Use these examples to make sure they know you are there to help them celebrate the great life ahead!